Course hours are: Saturday from 9 am – 8 pm, and Sunday 12 noon til 6 pm. Cost is $80 per participant. Registration can be made by emailing durantae192[at]gmail.com. Payment to be made in full the day of the course in the form of a cheque or cash. Cheques should be made out to “Scouts Canada- 1st Maxville Scouts”. Receipts will be issued promptly. There is an option to order lunch from a local pub, or you can bring your own lunch. Local Scout wins Orléans150 Award! Grace Breuer has been volunteering for years at school and with Scouts Canada, including helping younger youth, planning a camp to promote leadership, and helping with fundraising at school. Grace joined Scouting to follow her big brother — and stayed for the fun and friendships. Little did she know that the things she was doing for fun would lead to an award. 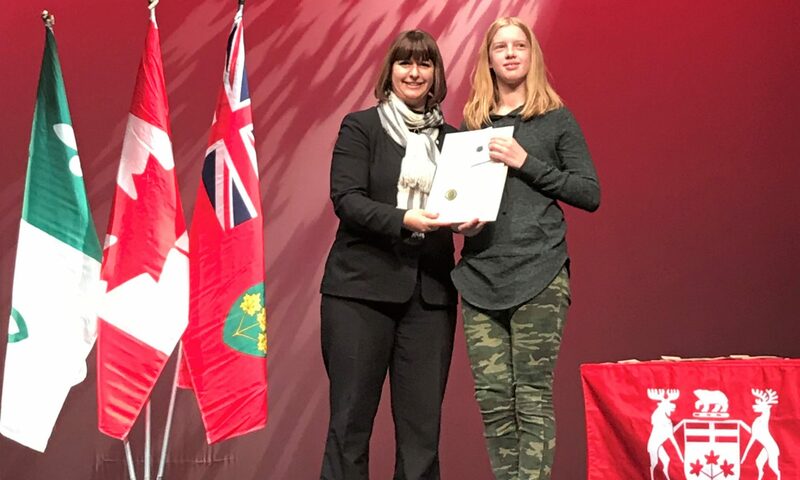 On December 1, 2017, MPP for Ottawa-Orléans Marie-France Lalonde recognized Grace’s hard work over the years and presented her with the Orléans150 Award at École secondaire catholique Béatrice-Desloges. Grace relishes her camping adventures: among her favourites were the team-building camp she planned with fellow Scouts and a high-adventure canoe trip to the rock slides in Algonquin Park. Recently, she and a few other Scouts planned every aspect of a camp for Cub Scouts (who are aged 8 to 10) graduating to Scouts (which is for ages 11 to 14). Planning included meals, campsite setup, safety precautions, activities and schedule. Grace has been in Scouting for 8 years and as a member of 8th Orleans Scout Troop, she helps out with the 8th Orleans Beavers (kids aged 5 to 7). She has planned and led meeting nights, and helped Beavers make friends and enjoy the outdoors. The younger members look to her as a role model, leader and mentor. Even with the many hours of volunteering, Grace maintains that the fun and opportunities she gets in Scouting far outweigh the effort she puts in. Want to give Scouts a try? Visit www.scouts.ca to find out where and when.